Malaysia Epson L360 Ink Tank System Color 3-in-1 Printer (Print- Scan- Copy- Manual Duplex- One Touch Scan & Copy) malaysia Supplier Office Supplies Company KL Kuala Lumpur Klang Valley Selangor . Don’t compromise on cost as you print. 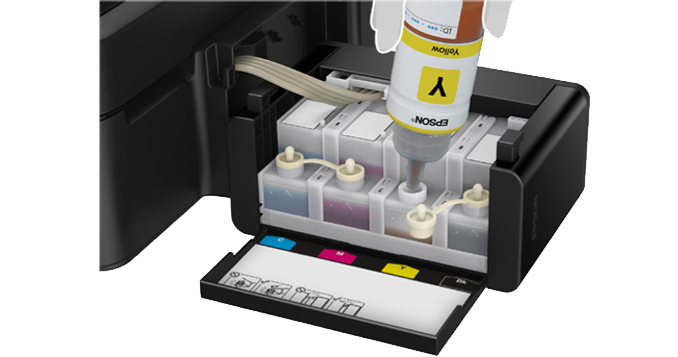 With Epson’s original ink tank system, you’ll be able to save costs as each bottle of ink costs only RM20 and each set has an ultra-high yield of 6,500 for colour or 4,000 pages for black. *1. Print speed (Pages Per Minute) is calculated when printed on A4 plain paper in the fastest mode, 10 x 15 cm photo print speed when printed on Epson Premium Glossy Photo Paper. Print speed may vary depending on system configuration, print mode, document complexity, software, type of paper used and connectivity. Print speed does not include rocessing time on host computer. *2. When printed on Epson Premium Glossy Photo Paper. *3. Default mode in accordance with ISO7779 for MFPs.